ROME (AFP) - – Italian researchers who specialise in resolving art mysteries said they have discovered the disputed identity of the model for Leonardo da Vinci's Mona Lisa -- and claimed he was a man. Silvano Vinceti, chairman of the Italian national committee for cultural heritage, said the Florence-born Renaissance artist's male apprentice and possible lover Salai was the main inspiration for the picture. However his claim was immediately disputed by experts at the Louvre in Paris, where the painting is on display. Salai, real name Gian Giacomo Caprotti, an effeminate young artist who worked with da Vinci for 25 years, is thought to have served as a model and muse for several of his paintings. The pair had an "ambiguous" relationship and were probably lovers, Vinceti said. Comparisons between the facial characteristics of figures from several of da Vinci's works -- such as "St. John the Baptist" and the "Angel Incarnate" -- reveal striking similarities with the Mona Lisa's nose and mouth, he said. "There are remarkable similarities," Vinceti told reporters. 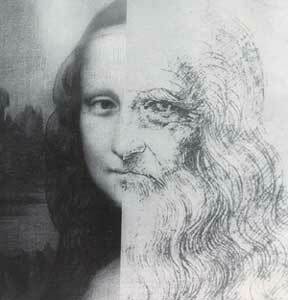 What is more, Vinceti said da Vinci had left clues to the model's identity in tiny letters L and S which he and his team found painted into the eyes of the Mona Lisa. But Vinceti's claims have been disputed by the Louvre museum. The museum said it had carried out "every possible laboratory test possible" on the picture in 2004 and then again in 2009, and insisted that "no inscriptions, letters or numbers, were discovered during the tests." "The ageing of the painting on wood has caused a great number of cracks to appear in the paint, which have caused a number of shapes to appear that have often been subject to over-interpretation," the Louvre told AFP. The museum also said Vinceti's had made his claims without having had access to the painting itself. The Italian aficionado, whose team gained notoriety with their claims surrounding the death of Caravaggio last year, said he felt sorry for the embarrassment the museum must feel on having missed the clues all these years. "I can understand their incredulity and amazement -- after all this must be the most studied picture on earth," he told AFP, but added "they're really blind." "They have to be serious and accept that they didn't see what was right in front of their eyes," he said. In order to clear up any lingering doubt over his theory -- worthy of Dan Brown's 2003 bestseller the "Da Vinci Code" -- Vinceti said he would be willing to take his team to France and collaborate on further tests with the Louvre. "We're ready to go to Paris and extract a tiny bit of paint from the numbers and see whether they match the rest of the painting, to see if they were done at the same time or are marks that have appeared over time," he said. Whether the prestigious art museum will take Vinceti up on his offer is yet to be seen. so this is a quest to prove da vinci was gay? or Mona Lisa is a man instead of ' his mother ' ? need to create so many stories to the painting or not? who cares who the model is male or female lover not lover? in the end is his uncle de friend de daughter de classmate de uncle de fren. Mona Lisa = Gay = Fake = Da Vinchi a cheat? if tts relli the gay partner, does it make the painting more or less valuable?